On Friday night Kelley and I returned from Orlando. Saturday afternoon I was off to France. 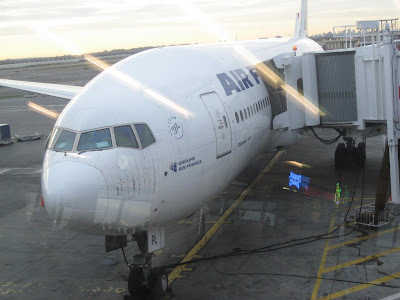 The first leg of my trip took me from New York (JFK) to Paris (Charles de Gaulle). The flight left New York around 6 pm and arrived in Paris around 6 am. The second leg of my trip, from Paris to Strasbourg, departed at 8:45 am and arrived a little before 10 am. It was a little confusing to fly during the Daylight Saving Time switch-over. When I arrived in Paris it was 5 hours earlier in New York. By the time I boarded my flight to Strasbourg it was 6 hours earlier in New York. When I arrived in Paris I had to clear Customs and locate gate D75 for my connection. My experiences with Customs in Europe have always been the same: the agent glaces at my passport, stamps it if I'm lucky, and waves me through. The agent says not a single word and the process takes about 10 seconds. It takes significantly longer to get through US Customs when returning from Canada. After clearing Customs I took a long walk to gate D75. I was too tired to do much more than watch the sun rising and people waiting. There was a man whose sneeze sounded exactly like Donald Duck saying "hi". There was a tall, thin albino man who held a newspaper an inch or two from his face. There was a man with a sweatshirt that read "Brooklyn Gym". And, of course, the obligatory man with truly repulsive body odor. The flight from Paris to Strasbourg was quick. The man sitting next to me looked like a less-obese version of the man who played Azamat Bagatov, the producer from the Borat movie. How do you start this car?